Check out these important reasons why your business needs a commercial fence. Fences are an important addition to just about any property, commercial or residential. Whether your property needs fencing for aesthetic or safety purposes, it can have a huge impact on your business. Homeowners and business owners alike use fencing for security, privacy, and visual appeal. But why does your business need a commercial fence? There are many benefits to having high-quality fencing on your commercial property, and a wide range of options to suit any needs your business may have. Following are just a few of the reasons your business needs a commercial fence, to meet any of your needs and motivations. Secure fencing is a concern for property owners of all types, whether it is a residence or business that needs security. Businesses are especially vulnerable to theft, vandalism, and trespassers on off-hours when nobody is on the commercial property. What you spend on a fence for your business can save you from major losses or vandalism cleanup in the long run. Plus, the right security fencing can help you restrict access to certain types of commercial properties, making it a good choice to meet a variety of business needs. The right fence can provide a private oasis to a business’s outdoor patio, or even keep competitors from seeing too much of your business operations. Many kinds of companies can benefit from the privacy of a commercial fence, including restaurants, manufacturing plants, or just about any commercial property that features an outdoor space. Fencing can provide a better workspace for your employees or a more enjoyable space for your customers. It can significantly benefit your business to mark your property boundaries with a fence, especially if your office building is in a highly commercial area. Differentiating your business from the rest can help your property stand out, and setting clear boundaries can help you avoid any disputes with neighbors or competitors. After all, property line disputes can get ugly, leading to feuds or even litigation. Installing a commercial fence can help business owners avoid such a headache. Finally, a commercial fence can boost the curb appeal of your business. With a wide range of colors, materials, and fencing styles available to you, your business can benefit from a fence that is functional and adds to your commercial property’s aesthetic appeal. Installing high-quality, stylish fencing can impress and draw in customers. After all, the outside of your business will speak to customers before they even enter. Having beautiful fencing can help you ensure their first impressions are good and increase business. 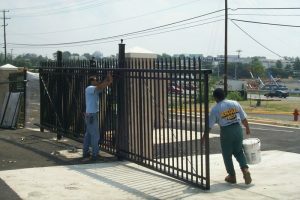 Hercules Fence DC has been providing homeowners with quality fences for over 50 years. We are well equipped to meet your needs, whether they are residential or commercial. We have extensive experience working with families and pet owners to keep the most important members of their home safe, so call us today about installing a new pet fence for your family. Contact us by giving us a call at 301-441-1600 or visiting us online. To see examples of our work, follow us on Facebook, Twitter, Google+, LinkedIn, Pinterest, and Flickr. This entry was posted on Friday, October 26th, 2018 at 12:34 pm. Both comments and pings are currently closed.